As a photographer I’m very lucky to work in a wide range of locations, so I thought it would be helpful to put together a Brighton Wedding Venues Guide. When I got married 3 years ago I really struggled to find a location in the area we wanted to get married. There is a lot of choice, but it involves a lot of searching, creating a comparison list yourself and trying to find reviews. And don’t even get me started on the huge range of pricing structures. It found it the most stressful part of planning our wedding. I hope you find this guide useful, and all opinions are simply based on my own experience whilst shooting weddings there. The images were also taken by me on the wedding day, so I hope they’ll give you a realistic idea of what you can also expect from the venue if you book it. This can be especially difficult if you are looking for a barn, which are often empty on the day you go to view them, so require a lot of imagination! All of these venue are either in central Brighton or in Hove. Located on Hove seafront with gorgeous views looking out to sea, this regency townhouse is a small but very attractive venue. The couple had use of 3 floors. The ground floor was used as the drinks reception room. The first floor boasts a stunning room with high ceilings and tall windows that fill it with light, which was used for the ceremony room, and was then transformed into the dining room for the wedding breakfast (whilst the guests had drinks in the ground floor room). The second floor has a beautiful bedroom and en-suite bathroom, which was used for bridal preparation in the morning and for the couple of the wedding night. Angel House doesn’t offer a garden of any outside space, however being located directly opposite the beach and the Bandstand the family, group and couple portrait photographs can be taken there instead. As far as I understand they don’t have a license for an evening party however, so you could need to hire a local pub or function room etc for the after party! It is absolutely beautiful, especially on a bright sunny day. 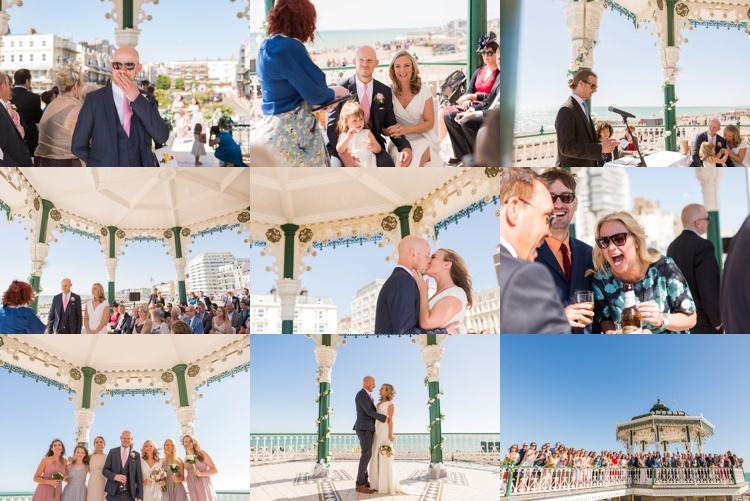 Run by Brighton Council, the bandstand was build in 1884, and it was restored and open for weddings in 2009. It is only available for ceremonies, and is very weather dependent, so it’s a risky option. If the weather is bad you have to get married in the cafe below it instead. So it’s a gamble, but one that pays off if you strike lucky! The can seat 50 people, with a further 30 standing. It’s a great setting for your photographs, or you can pop down the steps onto the beach. As you can see below, it’s even big enough for the group photo. However as it’s completely open on all sides it was hard to hear what the registrar and couple were saying during the ceremony, so I think it is worth hiring a microphone and speaker if you are considering this for your location. You can also have your drinks reception on the bandstand which is fab. 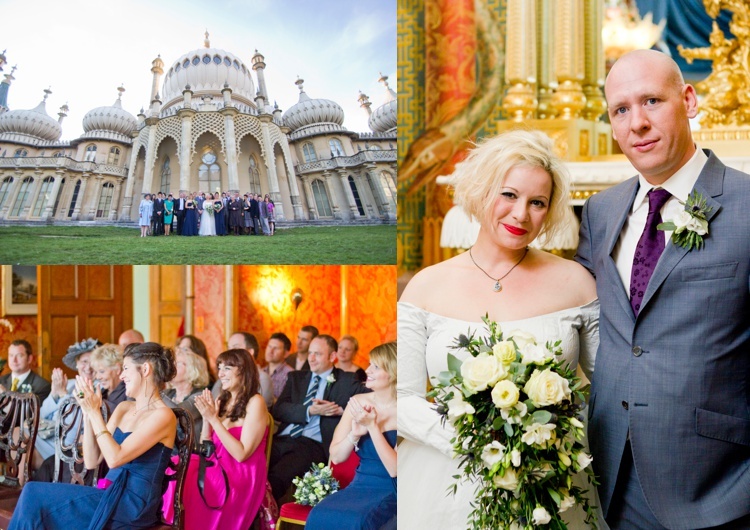 One of the most iconic Brighton Wedding Venues is the Pavilion. Built as there seaside pleasure palace for King George IV it is an eclectic mix of regency, Chinese and Indian influences. You have a choice of two rooms, the Red Room and the Music Room. The Red Room is smaller and is the most commonly used, however the couple can still use the Music Room for portrait photographs after the ceremony. However any photographs with you family and friends have to be taken outside. There are a further two rooms upstairs that can be used for your reception, however all of the weddings I have photographed in the Pavilion were only for the ceremony, so I can’t comment on using the Pavilion for a reception. Be prepared to be surrounded by tourists when you walk to and from the Pavilion, but that’s half the fun and to be expected in you’re getting married in a former palace! This large town hall offer 3 ceremony rooms to choose from depending own the size of your group (well actually 4 rooms- but one is the Old Police Cells Museum in the basement, so is one I’ve yet to work in, but might be a good idea for those of you wanting to combine a spooky element to the day!). The 3 regular rooms are the Regency Room for up to 50 guests, the Fitzherbert Room for up to 8 guests, and the Council Chamber for up to 120. I’ve worked in all 3 rooms, and the most commonly used is the Regency Room, which opens straight onto the square outside so guests can easily exit before you and then greet you with confetti! However the Council Chamber on the top floor has a stunning hallway area that is just perfect for couple photos (as below). I’m unsure if you can use the top floor for photos if you haven’t booked the Council Chamber, but it might be worth asking if you like the look of it. There isn’t anywhere on the ground floor in the Town Hall for photos (where the other 2 rooms are located), so you would need to go outside or down to the beach for your couple photos, and group and family photos. The following Brighton Wedding venues have only been used as reception venues for the weddings I’ve shot at. some of them may be able to offer to hold the ceremony as well, so I would recommend you check first if you want to have you ceremony and reception in the same place. A great little restaurant and bar, with a terrace area for sunny days. It’s within walking distance to the Town Hall (and a fun walk at that, through the very narrow passageways that run between the buildings and streets of the two locations). They offer both a sit down meal, and a canapé reception. When I was worked there it was the latter, and they served a variety of delicious canapés and small bites for hours, which created a relaxed and social atmosphere and is perfect for those of you looking for an informal wedding reception. This long running and fabulous fish restaurant is a favourite amongst Brightonians, and you can hire the whole restaurant. Located underneath the old arches direct on the beachfront. They also have a terrace area outside, so you can drink and dance whilst watching the sun set. Contact: 139 Kings Road Arches, tel. 01273 821218. This summer I’m also shooting a reception at Murmur on the seafront, which is a new restaurant under the arches next to the i360, and features award winning chef Michael Bremmer. So this would be another great option if you’re looking to hire a seafront restaurant for your reception. Contact: 91-96 Kings Road Arches, Tel. 711900. 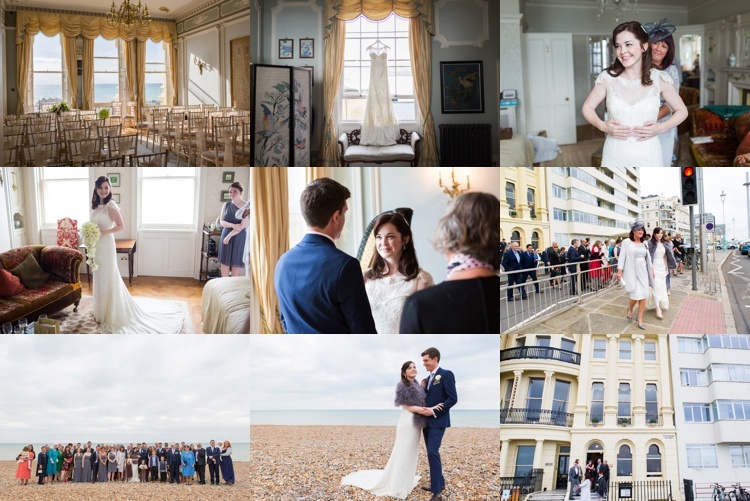 If this Brighton wedding venues guide has been useful, and you’d like to talk to me about your wedding photography, please feel free to contact me on info@jennifersmithphotography.co.uk or by phone on 07736 466004. You can also click the link to read another guide I’ve written on what to look for in Brighton Wedding Photographers.